We, ACHARYA ASTROLOGER are dedicate to spread the Spiritual Astrology all over the world. Each and everyone should have all the benefits of Spiritual Astrology and Vastu to get rid of all troubles and to live a joyful life. We are putting our all efforts to spread this true Knowledge through best media ,News papers,events etc. Pandit Gaurav ACHARYA is blessed by the Almighty (GOD) to have the capabilities to treat the people in such a way that they really overcome all of their problems in a magical way. Solving various problems of individual’s life, we have become one of the leading names in the field of astrology. We have been providing various types of astrological services like vedic Jyotish,Lal Kitab,Numerology,Vastu,Tantra Shastra,Gems Cunsultation & and so on. With our astrological services, we provide best solutions for various obstacles come in personal life, professional life,social Life,career etc. Today, we have firmly positioned ourselves as one of the preeminent providers of Astrology Services In India. 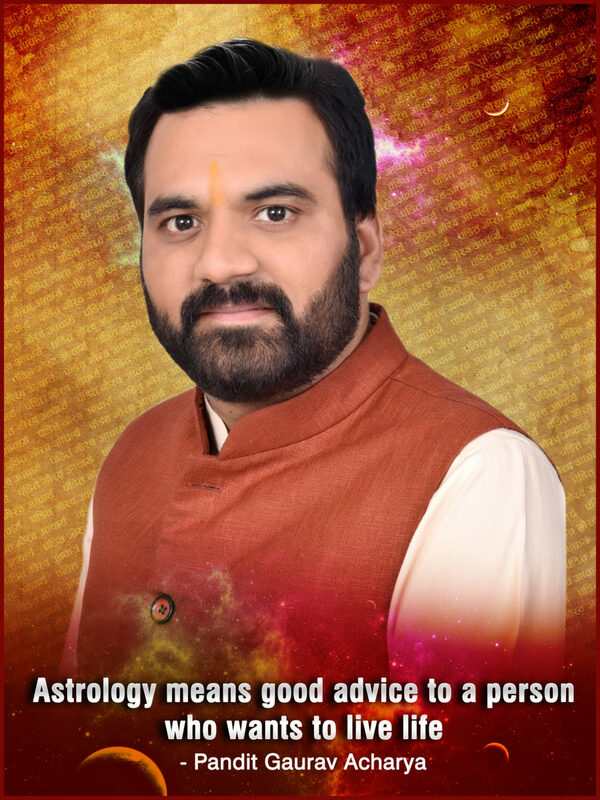 Our astrology services are given by well experienced and knowledgeable Pandit Gaurav ACHARYA , who has been purely dedicated towards humanity. With our services, we are sure to create a positive environment, prosperity and mental peace. By showing the right path to the valuable clients, we assist them in spending a peaceful, productive and happy life. ” A RIGHT DIRECTION FOR AN ACTION” is the vision of our Institution. Our Main aim is to restore ancient sciences which have been lost in the original Astrology, Which is over 5000 years old and has stood the test of time. As per the principles of Astrology, our stars control only 50% of our lives, and set the basic framework. The remaining 50% which shapes our lives is dictated by our own efforts and actions, and this accounts for the quality of our lives. It is also our aim to conduct research in the field of astrology and to establish and validate the principles of astrology on scientific basis. We also want to create a platform on the Internet for a free exchange of ideas on different aspects of astrology, and advanced astrological remedies. Studies are being conducted on different branches of occult sciences, and we aim to establish their relevance for the New Millennium. Tarot, Numerology and other such advanced astrology services for our members will be introduced in the near future.So We makes these ancient astrology principles more applicable for the New Millennium. Our aim is to apply the principles of this ancient art and science and help people all over the world, understand themselves better, and to help them “Take Charge of their Destiny”. This is how we make the life better and better filling with health, happiness, wealth and satisfaction.